* Green: Ok, this point is debatable, but I’m going with the historical angle on this one. For thousands of years, humans have used the milk of cows, goats, water buffalo, yaks, and other animals to create yogurt. So, no packaging, transportation, etc. These days, you can do your research and determine the greenest source of dairy or non-dairy milk you wish to use to make your yogurt. Plus, when you make it at home, you reduce your environmental impact by using the same containers to make your yogurt in week after week. In ancient Indian records, the combination of yogurt and honey is called “the food of the gods”. Persian traditions hold that “Abraham owed his fecundity and longevity to the regular ingestion of yogurt”. Given that I am half-Persian, I grew up with yogurt as a staple in our family’s diet and am excited to pass that along to my children. Strangely enough, I did not grow up making yogurt. It wasn’t until I was a young adult living in China and craving plain yogurt that I was given starter yogurt and taught how to make it by a fellow teacher at the school where I was teaching. In modern times, you can find it in most corners of the planet. While living in China, my husband and I were amazed that the Chinese children at our school coveted their (sugary) yogurt snacks despite the general dearth of dairy products in China. (Guess this shouldn’t have been a surprise since many lactose-intolerant tummies can digest yogurt, with its unique properties.) 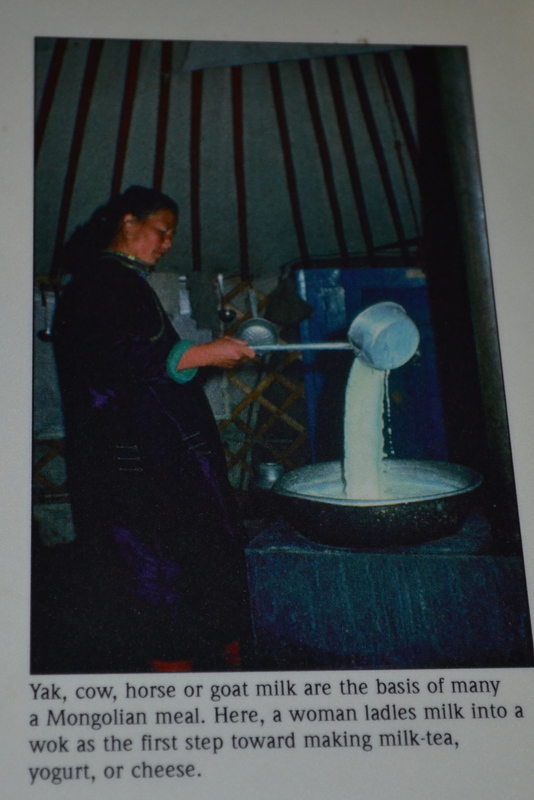 The reach of yogurt-eating struck us recently while studying Mongolia, when we discovered a picture of a Mongolian woman making yogurt in her ger (see below). * Character Cultivating – This is not an instant gratification recipe like baking cookies or making a smoothie. 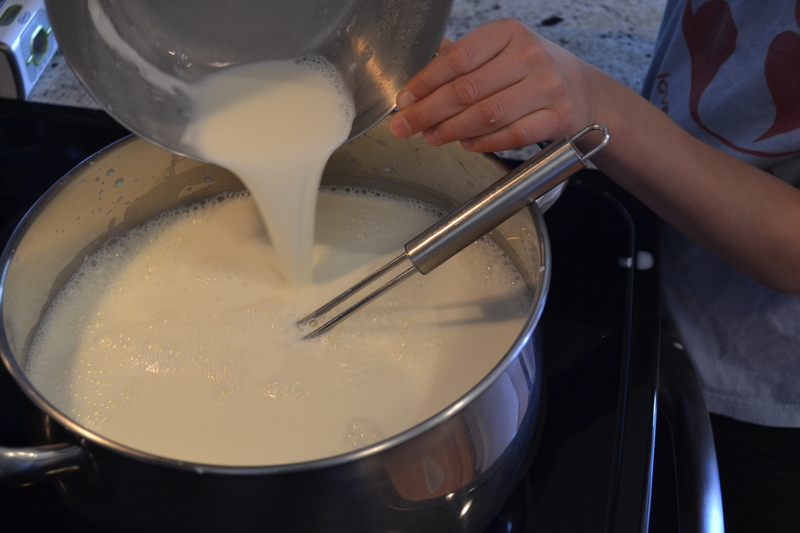 As you’ll see from the recipe steps below, yogurt-making takes hours. Luckily, you can go out with your little ones and do something fun or, if it’s overnight, catch some well-deserved zzzz’s while this baby does its thing. While all that good bacteria is growing in it, you’re also helping grow your own tender sapling’s virtue of patience. Our family’s yogurt recipe below really is kid-friendly. 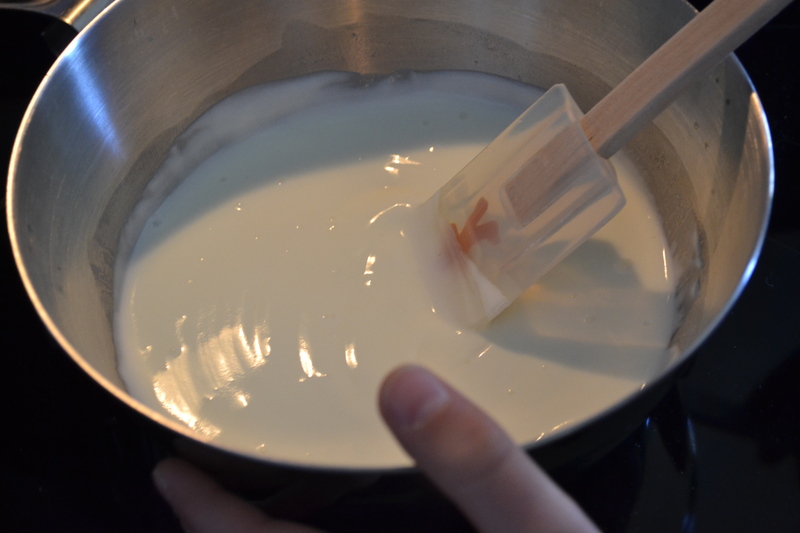 In fact, I almost titled this post “Yogurt Even the Kids Can Make.” Because, yogurt-making really is that easy. In the pictures below, our 9-year-old son is demonstrating most of the steps. 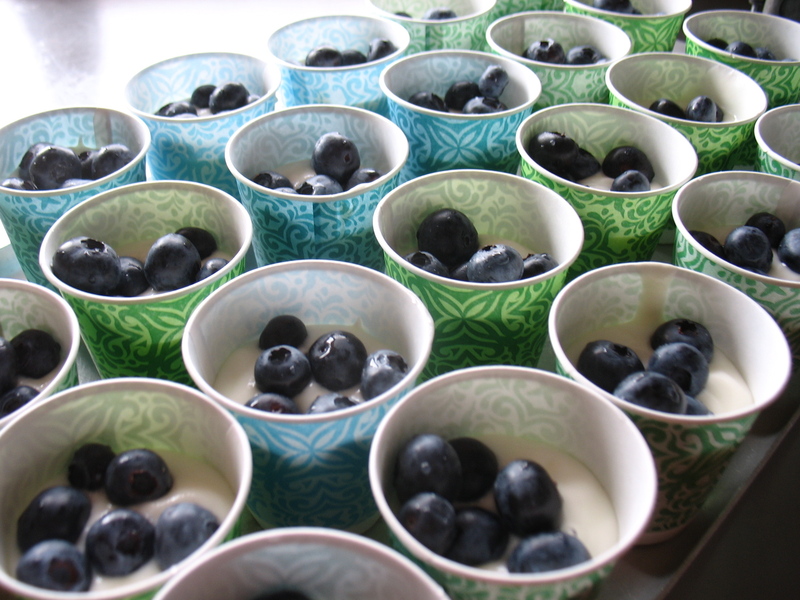 There are many yogurt recipes out there. The general guidelines you’ll find list somewhat different temperatures than what we’ve found works best for us. So our variations might suggest how flexible yogurt-making really can be. Which makes sense to me, given people have been making it for some 2,000+ years under all sorts of conditions. Here’s our simple method that works like a charm for us. 1. 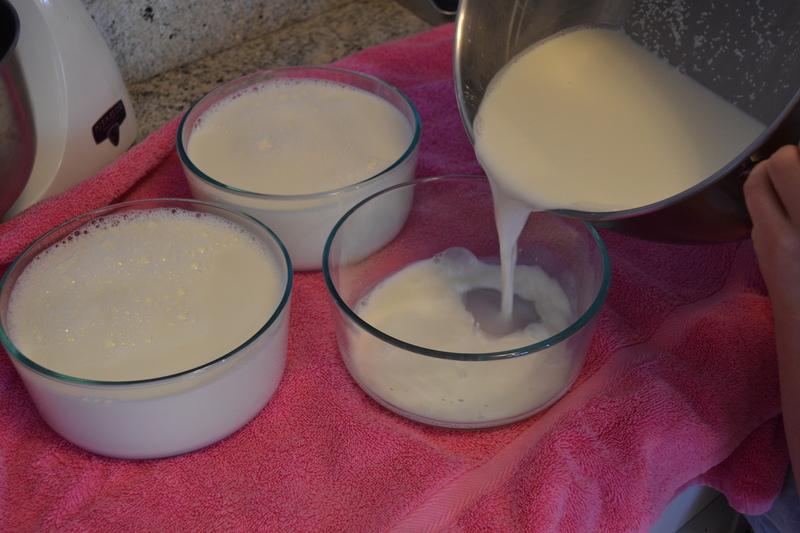 Place 1 1/4 cups starter yogurt in a medium-sized bowl and allow it to come to room temperature while heating the milk. 2. 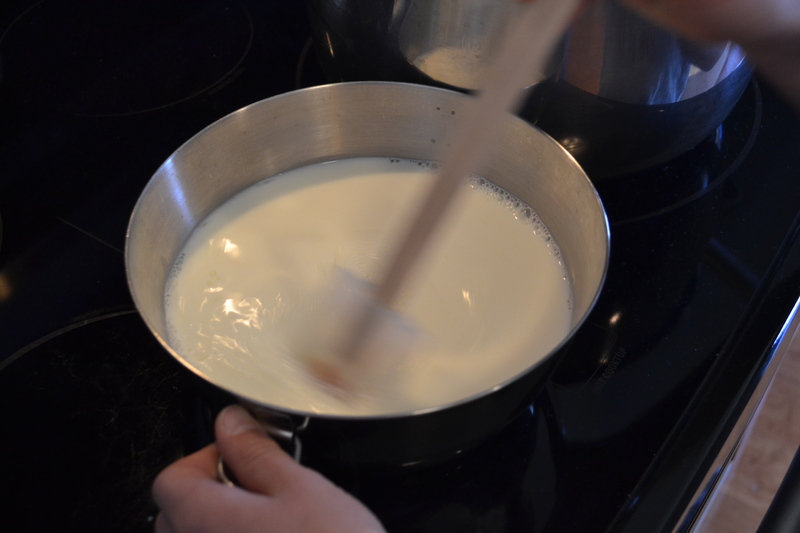 Pour milk into a very clean pot and heat gradually on medium heat. We do not stir it at all during the heating process and find that very little milk sticks to the bottom if the pot is extremely clean. A Mongolian woman making yogurt inside her ger. 3. 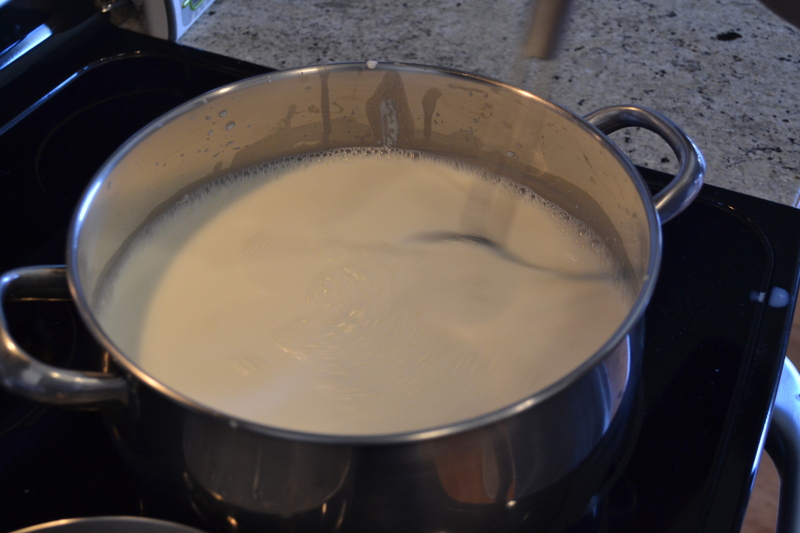 Heat milk to 180 degrees Fahrenheit and then remove from heat to begin gradual cooling. 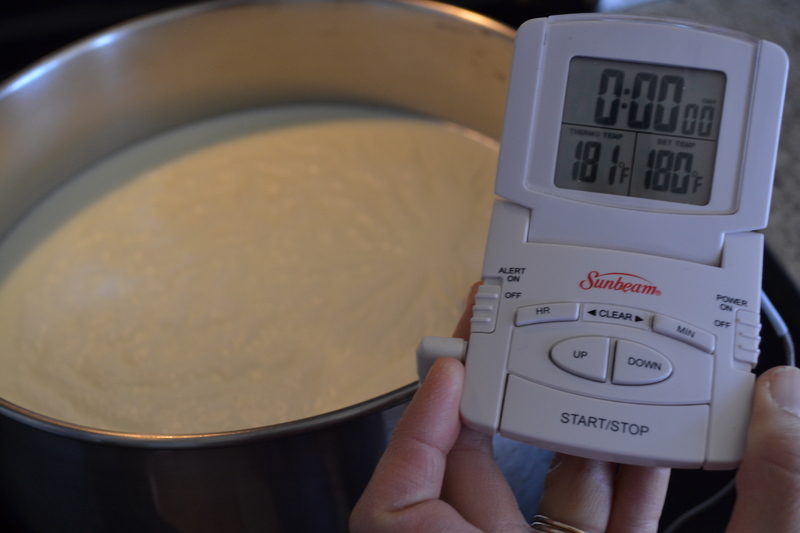 We find this handy food thermometer very helpful in gauging the temperature of the milk. Once the yogurt is warmed to 180, we simply place the pot on the counter to cool off. 4. 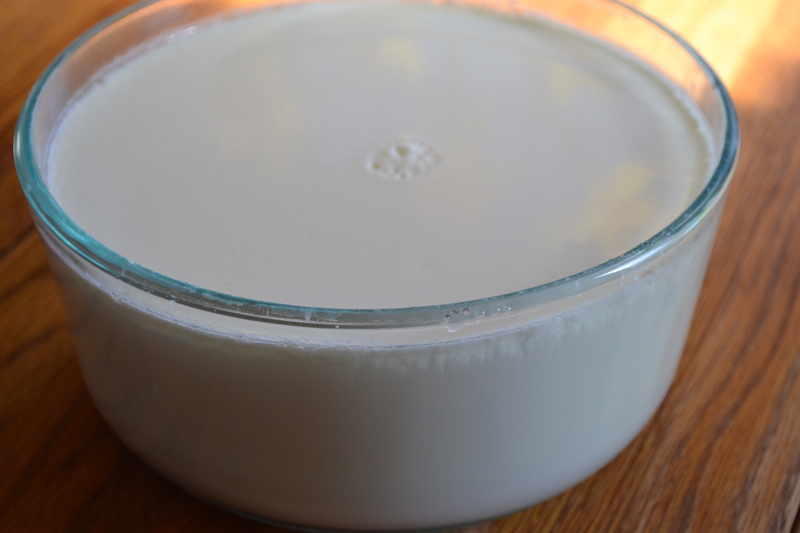 As the milk temperature approaches 125 degrees Fahrenheit, get the clean containers for the yogurt ready. 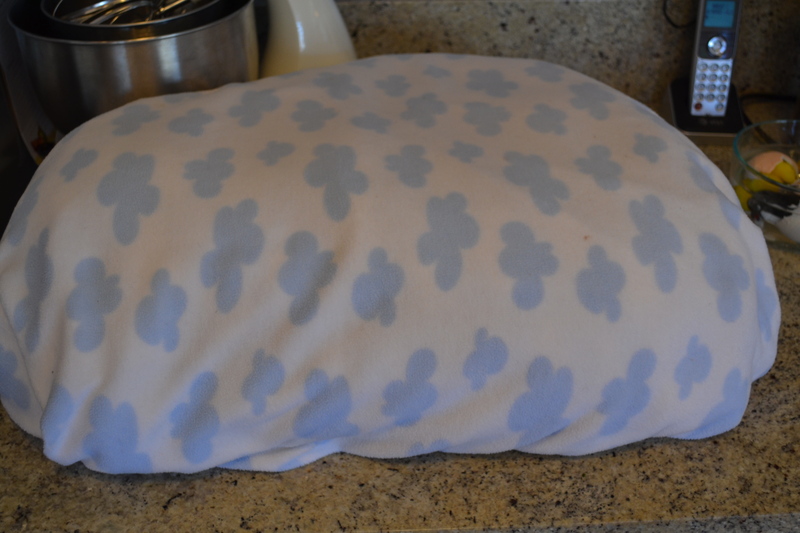 Place open containers on a towel on the counter where they can sit undisturbed for at least 12 hours. We use these glass Pyrex 1.75 quart/1.65 liter containers with lids and they work beautifully. 5. 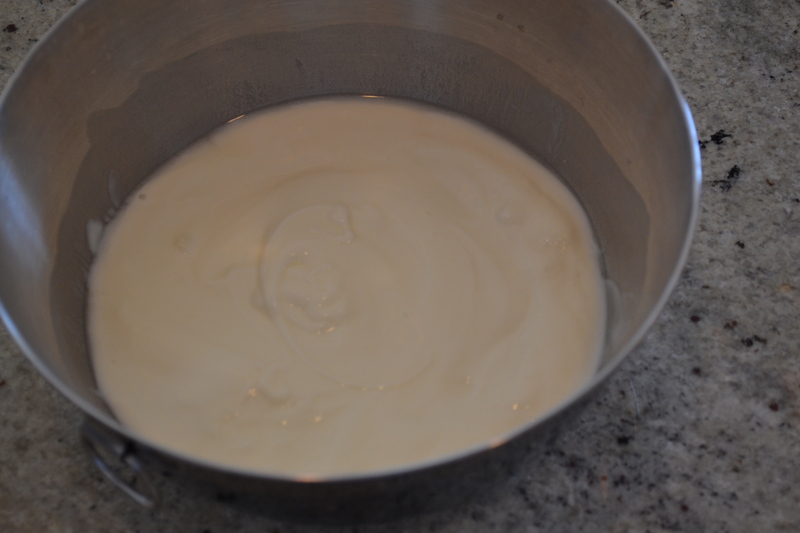 Stir up the starter yogurt, which should be room temperature now, so it is nice and smooth. 6. 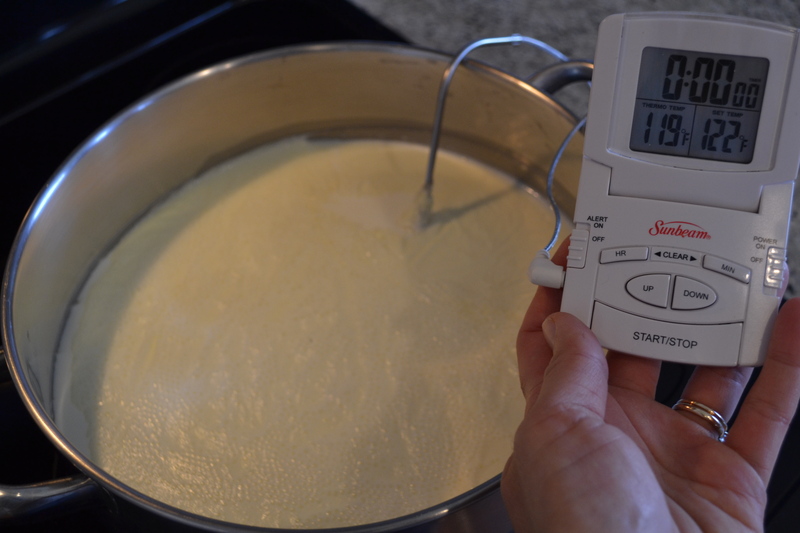 Once the milk reaches 119 degrees Fahrenheit, the fun begins! 7. Skim off the film from the top of the warmed milk. 8. 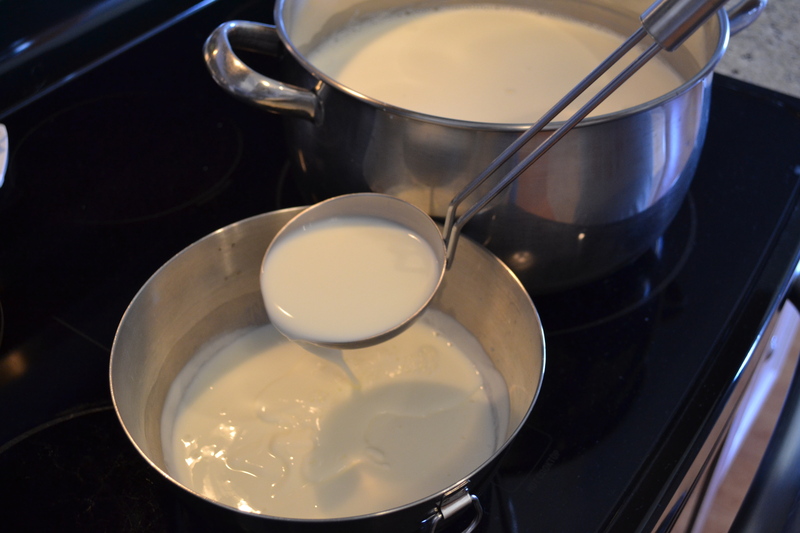 Ladle 4-5 ladles-full of the warm milk into the bowl of starter yogurt. 9. 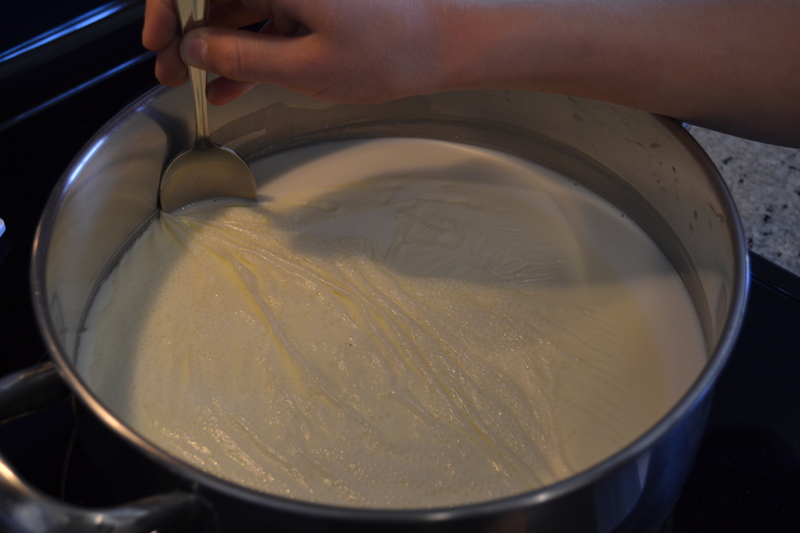 Stir up the starter yogurt with added milk. 10. 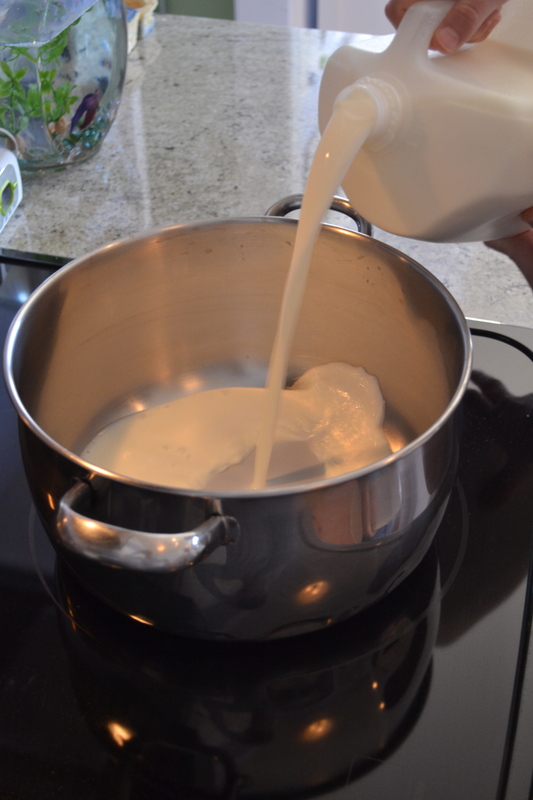 Pour the starter yogurt with added milk into the big pot of milk. 12. Pour into prepared containers. 13. 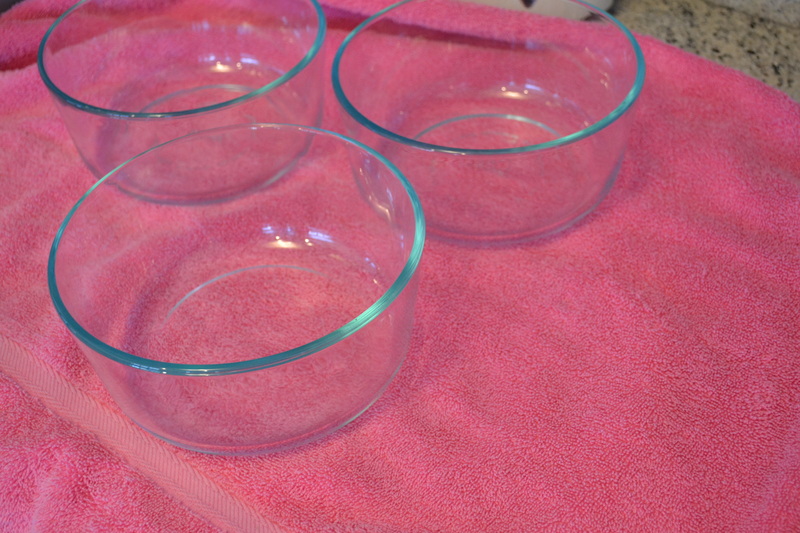 Put lids on containers and tuck in with warm blankets to trap the heat and allow it to incubate as it gradually cools. We use three baby-size fleece blankets. Isn’t it cute and cozy? 14. Go have some fun or catch some zzz’s for 12 hours while the yogurt sets. Then stick it in the fridge ideally for 5+ hours and it is ready to enjoy! 15. Eat plain, add fresh fruit as we did for our Mongolian Culture Club gathering (pictured here), have dada and the little ones make a fruit parfait to treat mama, etc., etc. We’d love to hear your favorite recipes that use yogurt in the comments below! Wow! You did it! Hope you had fun making homemade yogurt with your tender sapling and growing some good bacteria while going greener, celebrating a global favorite food, and growin’ patience! What are your favorite recipes for expanding your child’s heart and mind? Thanks, Anita! Let us know how your yogurt-making goes!